Andre Hajdu was born in Hungary in 1932. He studied at Liszt Music Academy in Budapest with Szervanszky and Szabo (composition) Szegedi (piano) and Kodaly (ethnomusicology). He was involved in research about Gypsy’s musical culture and published several articles on this subject. In 1955 he won the first prize with his Gypsy Cantata at the competition of World Festival of youth in Warsaw. In 1956 he emigrated to Paris and continued his studies at the Conservatoire with Darius Milhaud (composition) and Olivier Messiaen (philosophy of music) and obtained the 1st price in the discipline. Since 1966 he lives in Jerusalem. He taught at the Tel-Aviv Music Academy 66-91 and at Bar-Ilan University, (since 1970). He served as chairman in the Music Department there and founded a composition department. 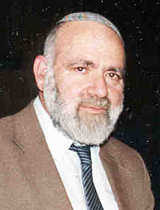 Paralelly he studied Jewish Klezmer and Hassidic repertories and published several articles on this subject. As a composer he was and is deeply involved in Jewish topics, not only on the usual folkloristic or liturgical levels, but also confronted more abstract subjects of Jewish thought (Oral Law, philosophical books of the Bible) as well as Jewish History. In 1997 he obtained the Israel Prize for his oeuvre in composition, research and teaching.